This summer, one of our self-directed programs is our Engineering Table. During the school year, we offer a craft table with a different self-directed craft each month. Over the summer, it's too cumbersome to refill supplies and keep a craft table stocked, so we have turned it into an activity table. This year, to go with our Summer Reading theme of Build a Better World, the table is all about engineering. I put the Engineering Table up this week when our Summer Reading Club started and it has already been a big hit! I wasn't sure if kids would engage with the materials - they look so handmade - but they dive into it, making some really interesting creations. We've seen a lot of families engage in the table together, having some great conversations as they build together. That's exactly what we wanted! I love providing self-directed activities because it means that no matter when a family stops by the library, there's something for them to do. We may not have a program for their age going on every single day this summer, but we always have some type of activity they can do. We mention the Engineering Table in our printed program calendar and I added it to our web calendar so that families who are looking will realize that there is always something for them to do at the library. Each week, I'll change it out with some activities being more "handmade" and some being more polished (see our full schedule below). 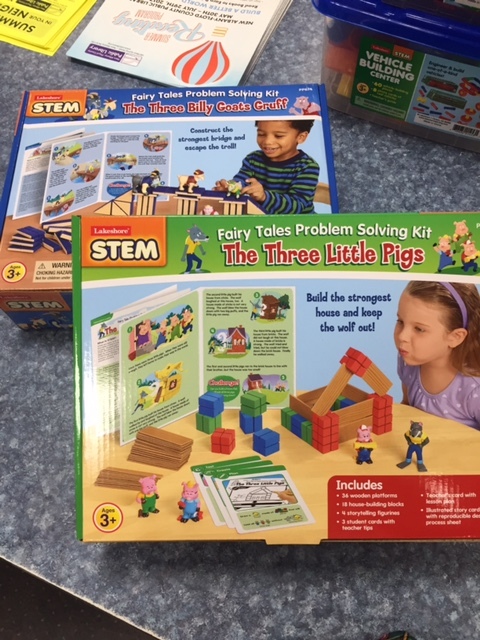 I purchased several sets from Lakeshore Learning to use with the table. Some of these sets could be homemade if you're tight on funds. I was tight on time, so ordering the sets was easier for me. Week 1: Building with craft sticks, clothespins, and binder clips (source: Frugal Fun 4 Boys). Do you have any self-directed programming planned for this summer? I would love to hear about it in comments!